Usually a DIY project entails upcycling an old table and integrating it into your current home aesthetic or installing a TV bracket for your flat screen. And when it comes to anything food-related, it is usually homemade biltong that’s the go-to project for most. But we want to challenge you to expand your horizons and try something new in 2018. Our suggestion? Curing your own bacon at home. Yes, we said it! And, it is not as difficult as you think- see it as a fun project that will have the tastiest outcome ever- BACON! So without further ado: Here’s how to cure your own bacon! As with most things in life, it all starts with a good foundation. In this case, it means searching for the right pork belly. We suggest sourcing from a farm that is committed to the well-being of the pig and the greater environment, and doesn’t compromise when it comes to ethically rearing them. So, be sure to do your research and find the right butcher to help you out. Remember, humanely raised pigs tend to have richer, tastier meat as well, so it really does make a difference in more than one way. STEP 2: The first slice… be careful! You’ll see that the bottom of the pork belly is covered in rind, which is a layer of tough skin. Use a sharp knife to carefully cut and remove the rind (don’t throw it away!). You want to get rid of this because the skin usually gets in the way of the meat absorbing all the smoky goodness. Start at one corner and use a sharp, slender knife to separate the skin from the meat, angling the knife blade toward the skin. TIP: you can also ask your local butcher to do this for you! Now, when it comes to the skin, you can chop it up and use it to make crackling by deep frying it in some oil until it is golden brown. The basic ingredients are salt, sugar, curing salt (optional) and pepper. Of course, there can be variations based on your personal taste: in terms of the sweetness, the sugar can be substituted with maple sugar or freeze-dried cane sugar juice; and in terms of spiciness, you can add crackled black pepper or chilli flakes. STEP 4: Rubbing the belly! Place the pork belly on a baking sheet and generously apply the rub all over. Try and get it as evenly coated as possible. Transfer the belly into a large, re-sealable bag in a roasting pan (a foil one will work as well), and place it at the bottom of your fridge. Leave it to marinate for 5 days and turn it over every day to ensure all the flavours soak in thoroughly. After 5 days, transfer the soaked pork belly to a colander in the basin. Rinse both sides with cold water to remove any excess salt. 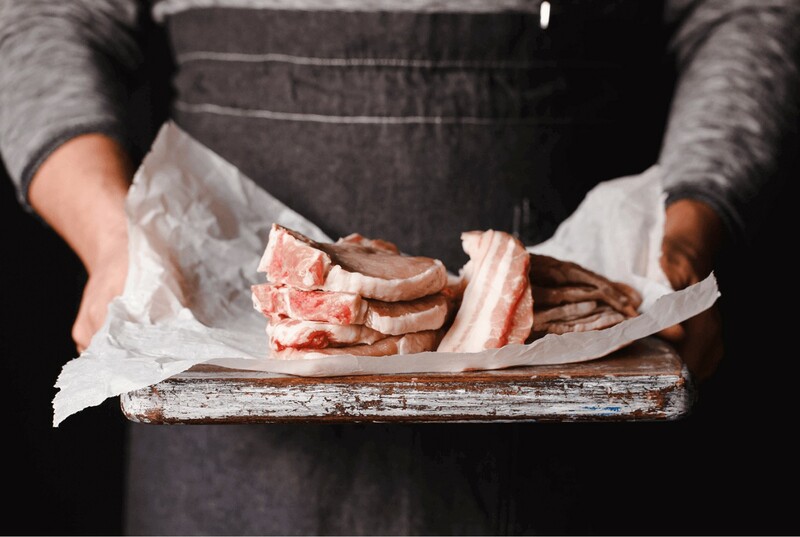 Use a clean cloth to dab the pork belly until it is dry and then place it on a wire rack with a baking sheet over it on the bottom of your fridge. Let it dry overnight or 4 hours, at least. It’s best to turn it at least once as well. This process will help with the formation of a pellicle- which is a layer of protein that forms on the surface as the belly air-dries. Smoke particles stick more evenly to a dry piece of pork belly. Set up your smoker (you can use a charcoal, electric or gas one) and pre-heat it to about 175 degrees. For smoking fuel, it’s best to use beach wood. The goal is to get the internal temperature to a consistent 150 degrees. Insert the pork belly and let it smoke for 2 to 3 hours. Allow the pork belly to cool to room temperature on a wire rack over a baking sheet. Next, wrap it tightly in plastic and refrigerate overnight. This will let all the smoky flavour and delicious texture to set properly. STEP 8: Time to tuck in… well, almost! All that is left to do is slice it, fry or grill it and ENJOY! One of the many benefits of having a chunk of pork belly to slice bacon from, is that you get to decide just how thin you want your slices to be. P.S: If you don’t want to go through all the effort of curing your own bacon at home, just pop into the shop and buy some delicious Woody’s Bacon!